My birthday is just around the corner and I always love my birthday. I am a little obnoxious about it… okay, more than a little. But I also love to cook for the family too. 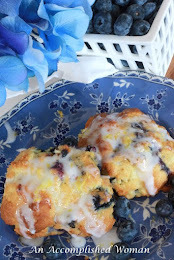 This Sunday’s brunch is a symphony of color. How could I not want color after such a long winter. 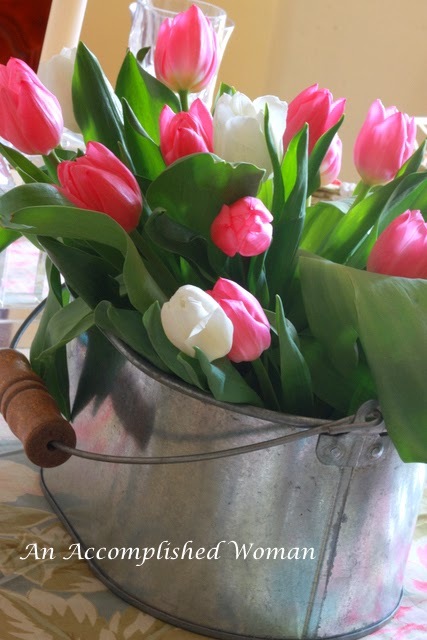 Pink tulips corralled in a galvanized bucket, lose and informal. 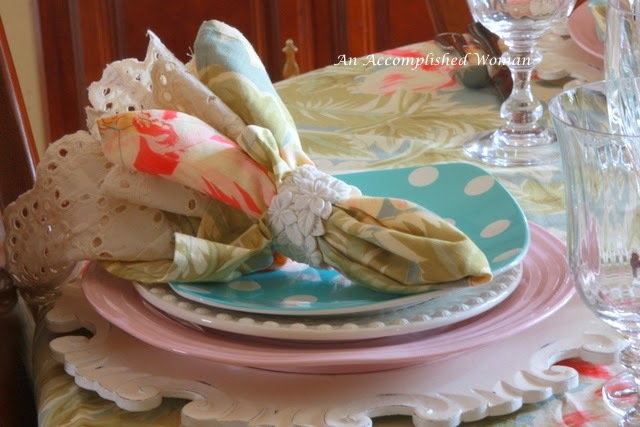 Coupled with pretty ivory napkin rings. I love these cute place card holders, very festive for anyone's birthday. 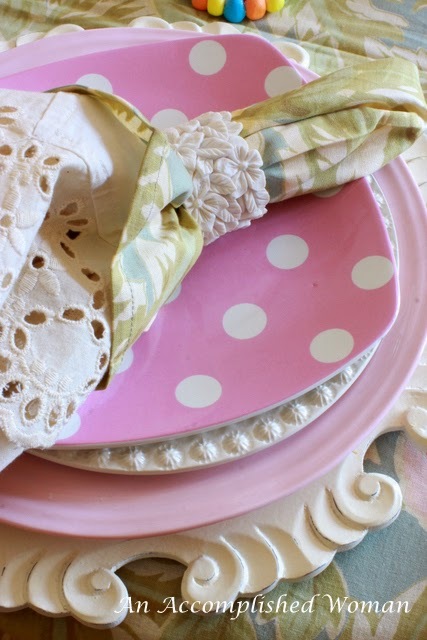 Colorful polka dot plates, a bargain at Hobby Lobby… pink for the girls and blue for the boys. Soft pink dinner plates on top of Pier One chargers. 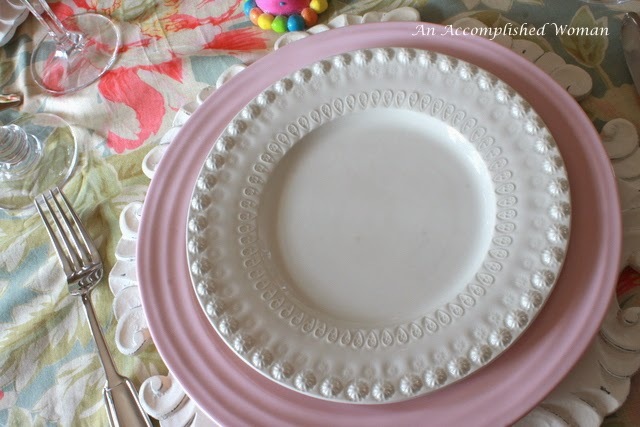 Cream accent plates that tone down the colors. 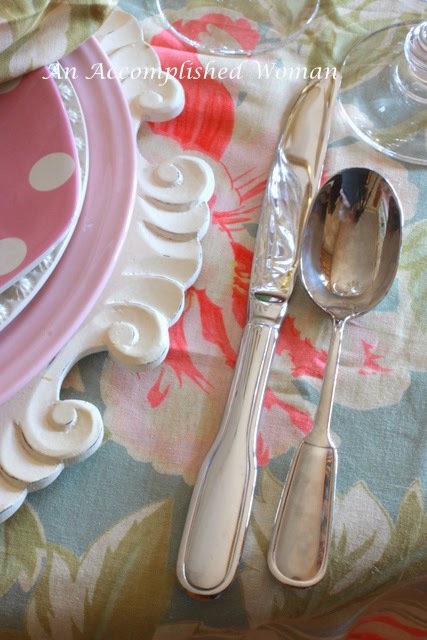 I used plain flatware on this table to focus the eye on all the color. 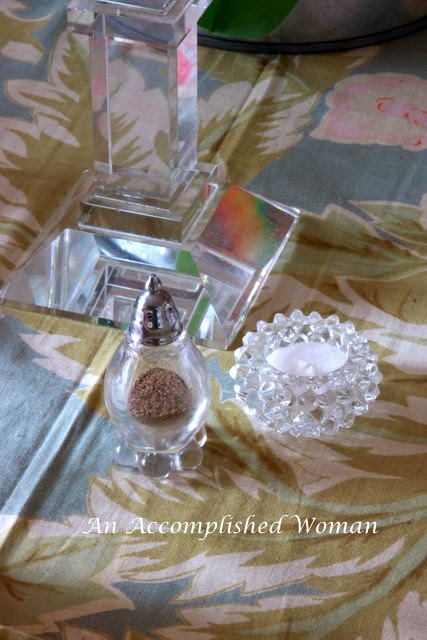 Cute Salt cellar and pepper. I am most thankful for my hubby, children and grandchildren, who let me dress them in funny Christmas card outfits, matching Easter outfits, eat at waaaayyyy over dressed tables, eat my hits and my misses (with little complaints) and love me as I am… as I love you all. I LOVE your tulips in the bucket! Great looking! 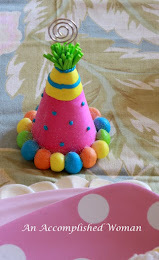 and your polka dot plates are so much whimsical birthday fun with those adorable party hat place card holders! So cute! Happy Birthday- mine is Monday! 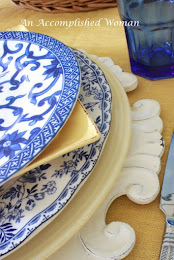 That April Cornell tablecloth has great colors- love it! 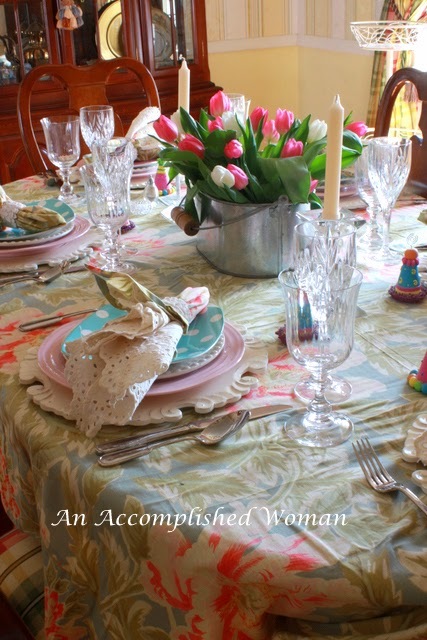 Your table is so cheerful- love all the happy colors and the tulips! Wow! 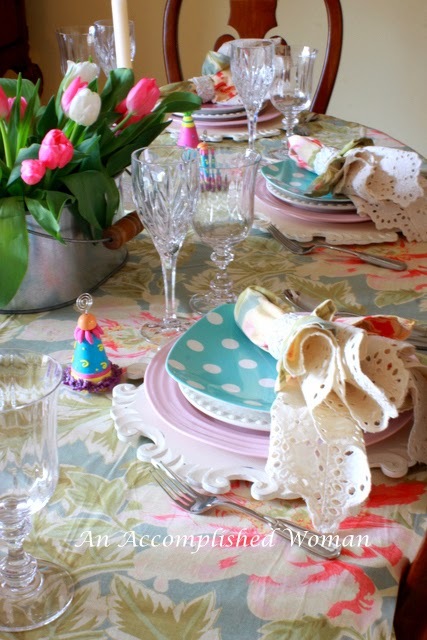 There must be something about being born in March that makes us all want to set beautiful tables!!! Happy Birthday! and nothing is more appropriate than cheerful polka dots. 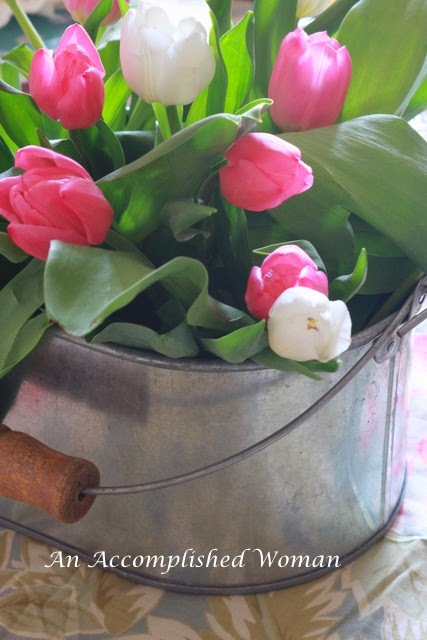 I love the tulips in the galvanized bucket, informal but gorgeous. 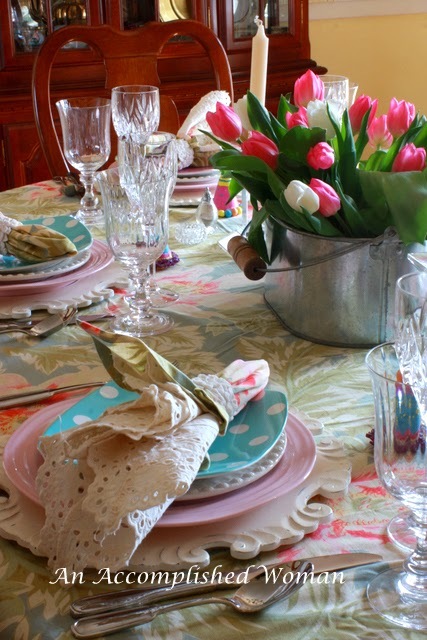 Love those tulips and the different colors of plates. Just beautiful! 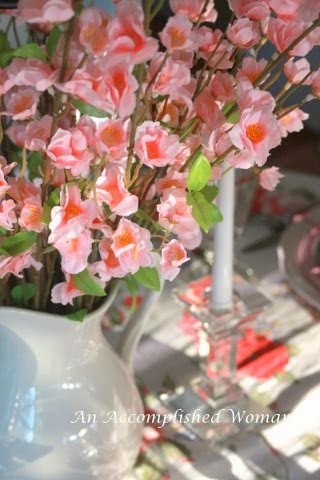 Your table is so pretty. 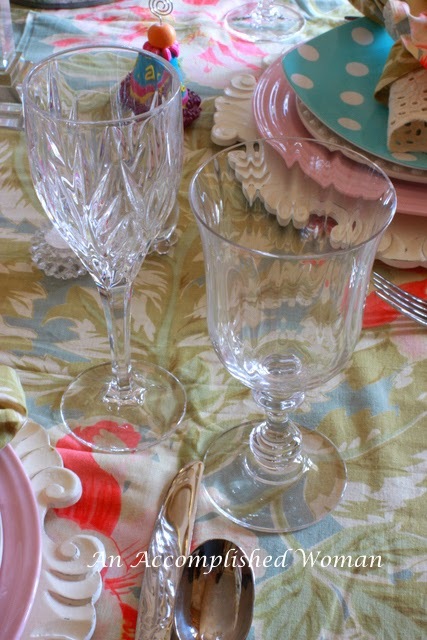 I love the pastel colors and the mix of patterns. 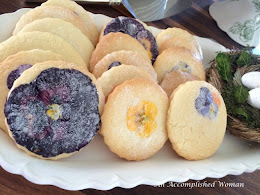 Don't you love April Cornell items? Years ago I had a dress from her line. Now I just have tea towels but they are exceptionally pretty. Happy Birthday! 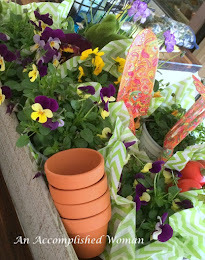 Love your table, which is covered with beautiful Spring colors!! 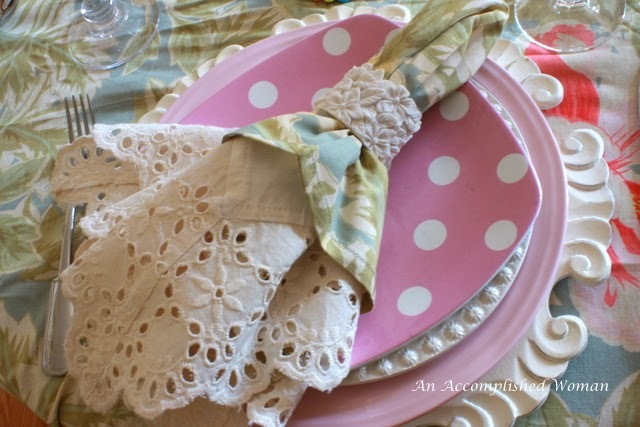 Those polka dot plates are adorable and the linens are just perfect!